Your liver is the “Swiss Army knife” of your health and wellbeing. It regulates your body’s nutrient absorption, provides you with energy, helps keep your digestion smooth… it even gives your skin that youthful glow. That’s why it’s important to give your liver the assistance it needs. And now you can, with Gundry MD Complete Liver Support. When it comes to keeping your body strong, healthy, and active — your liver is the “unsung hero.” It keeps you protected from vitality-crushing environmental toxins. It also purifies your body, just like a filter makes water healthy and drinkable. That’s why it’s important to give your liver the help it needs — with Gundry MD Complete Liver Support. Vastly improved energy levels through enhanced nutrient absorption. Support for your healthy immune system. Easier digestion, so you can feel less bloating and stomach discomfort. A happier mood and improved focus. 1 1Sun J. D-Limonene: safety and clinical applications. Altern Med Rev. 2007 Sep;12(3):259-64. 2 Davaatseren M. Dandelion leaf extract protects against liver injury induced by methionine- and choline-deficient diet in mice. J Med Food. 2013 Jan;16(1):26-33. doi: 10.1089/jmf.2012.2226. Epub 2012 Dec 20. 3 Huang Y, Liu Y, Dushenkov S, Ho C, Huang M. Anti-obesity effects of epigallocatechin-3-gallate, orange peel extract, black tea extract, caffeine and their combinations in a mouse model. J Funct Foods. 2009;1(3):304-310. doi:10.1016/j.jff.2009.06.002. 4 Abenavoli, L., Milk thistle in liver diseases: past, present, future. Phytother Res. 2010 Oct;24(10):1423-32. 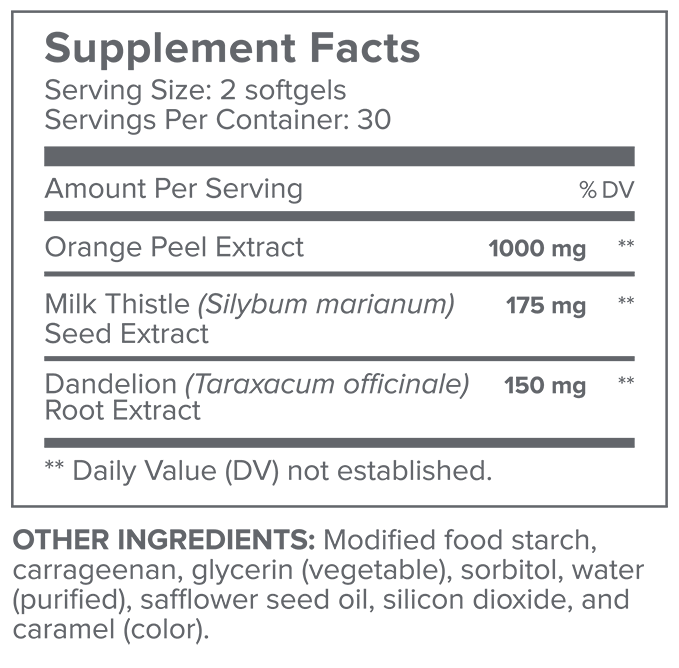 The most popular order for new customers is the 3-bottle package. However — many of our long-time customers like to get even bigger savings on our 6-bottle options. WHAT ARE THE INGREDIENTS IN GUNDRY MD COMPLETE LIVER SUPPORT? HOW DO I USE GUNDRY MD COMPLETE LIVER SUPPORT? To experience the full range of benefits of Gundry MD Complete Liver Support, take 2 easy-to-swallow soft gels a day, with a full glass of water. HOW DO I KNOW IF I SHOULD TAKE GUNDRY MD COMPLETE LIVER SUPPORT? 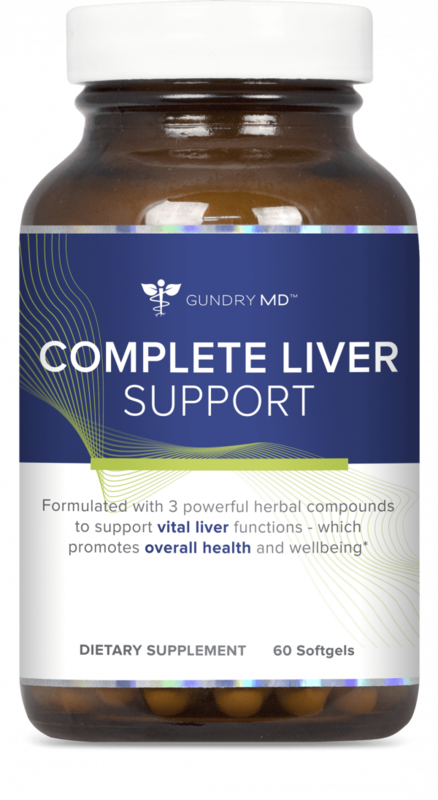 Gundry MD Complete Liver Support is formulated to support your liver — the “unsung hero” that helps your body absorb more nutrients, enjoy smooth digestion, feel youthful energy… even have healthy, glowing skin. That’s why Gundry MD Complete Liver Support is perfect for anyone who wants to feel stay healthy, feel strong, and look incredible. And I recommend everyone try it and experience the jaw-dropping results it can have for them. HOW SAFE IS GUNDRY MD COMPLETE LIVER SUPPORT? Gundry MD Complete Liver Support contains only 100% natural and bioavailable ingredients. This formula is tested for quality and purity at an independent 3rd-party facility. However, as a physician, I recommend consulting with your own doctor, before starting any new program. WHAT IF GUNDRY MD COMPLETE LIVER SUPPORT DOESN’T WORK FOR ME? IS THERE A GUARANTEE? Absolutely. We’re as proud of our industry-best customer support as we are of our groundbreaking supplements. So, if for any reason you aren’t blown away by what Gundry MD Complete Liver Support does for energy, strength, and vitality — just send it back within 90 days for a complete refund of your purchase price. No questions. No hassles. No worries. But I’m confident you’ll love what this formula does for you.